The hills of Anatolia have long been a honeycomb of nationalities, petty states, religious enclaves and banditry. The recent influx of Turkish Nomads have merely been another pinch in the potent concoction of Armenians, Greeks, Kurds, Arabs, and various tribal peoples. A crossroads for the great empires of the age, a rugged realm made all the more rough by an intimacy with war and all its ills has bred a people of similar disposition.Of various birth, creed, and way of life in peace, the brotherhood of bandrity unites them in serivce to any and all powers who offer them a chance at wealth./n/nTheir arsenal is limited and modest, being the simple leather or cotton kaftans, aketons, and common robes worn during all stretches of their impoverished lives. 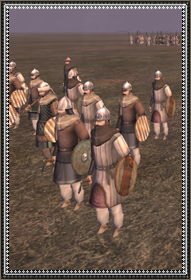 With rugged axe worn by bone and bark as well as simple wooden shields these hillmen fight with no training and no discipline, resembling the barbarians of old who swept into Galatia save for lacking their own tenacious courage. Even so, amongst rugged landscape and forested hills they do offer a worthwhile presence as light infantry to harass the enemy.